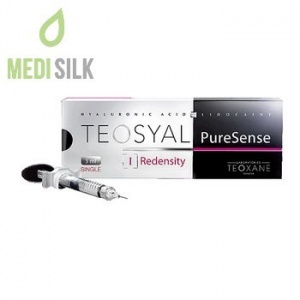 Teosyal Redensity I PureSense is an unique skin enhancer designed to prevent premature skin ageing, to restore skin density and radiance. A specially formulated gel with a dermo-restructuring complex of 8 amino acids (Glycine, Lysine, Threonine, Proline, Isoleucine, Leucine, Valine and Arginine), 3 antioxidants (Glutathion, N-acetyl-L-cysteine and Alphalipoic acid), as well as Vitamin B6, minerals (Zinc and Copper) and lidocaine. 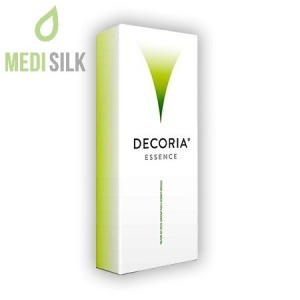 Its basic component is hyaluronic acid, which is naturally present in the skin, but with age, its synthesis decreases and the first signs of ageing appear. By replacing the lost hyaluronic acid in the skin, Teosyal Redensity I PureSense restores the skin hydro balance and makes it look plump, smooth and radiant again. 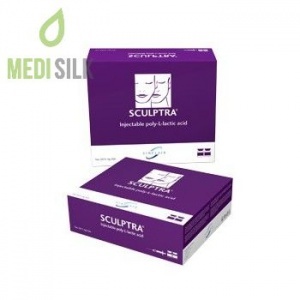 All the components inside the composition of the dermal filler are selected for their pharmaceutical grade, hypoallergenic properties, and compatibility with hyaluronic acid. The amino acids stimulate the production of collagen fibers and take part in the healing process and tissue remodeling. Antioxidants, in turn, prevent damage to the cellular structure, caused by free radicals, stress, environmental pollution, inappropriate diet, etc. The added minerals Zink and Copper take an active part in synthesis of new cells. Vitamin B6 is essential for energy production for cell metabolism in the dermis. 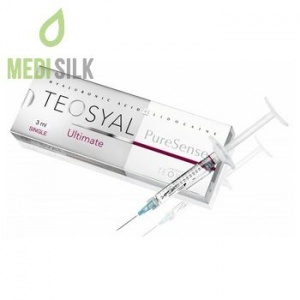 Teosyal Redensity I PureSense is suitable for treatment of the face, neck, neckline and hands. Usually the treatment consists of multiple injections administered across the dermis, allowing the hyaluronic acid and the dermo-restructuring complex to be spread evenly into the skin. For optimal results, three sessions at three-week intervals are recommended. The effect is cumulative with each session. The skin is hydrated from deep inside, plumped and with smoothed features, rejuvenated and radiant. 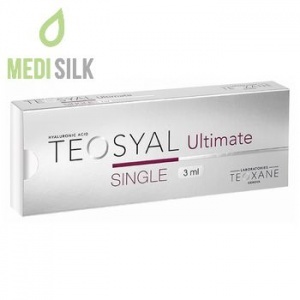 The great effect of Teosyal Redensity I PureSense lasts up to 18 months and after that, you will need 2 to 3 follow-up sessions to maintain the desired effect. 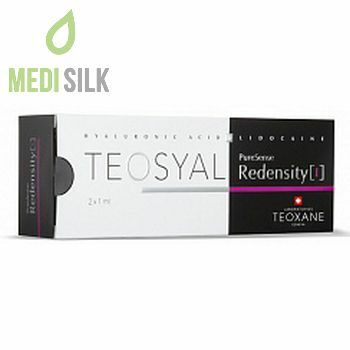 Teosyal Redensity I PureSense is manufactured by the Swiss cosmetic company Teoxane, which has reputation as an acknowledged leader in the aesthetic market. With over ten million treatments carried out worldwide, Teosyal dermal fillers have proven its efficacy and safety profile.